In order to derive the full three-dimensional wind vector, the NERC MST Radar uses the Doppler Beam Swinging technique. Observations must be made in a minimum of 3 non-coplanar beam pointing directions, which include the vertical and at 6° off-vertical in two orthogonal azimuths. 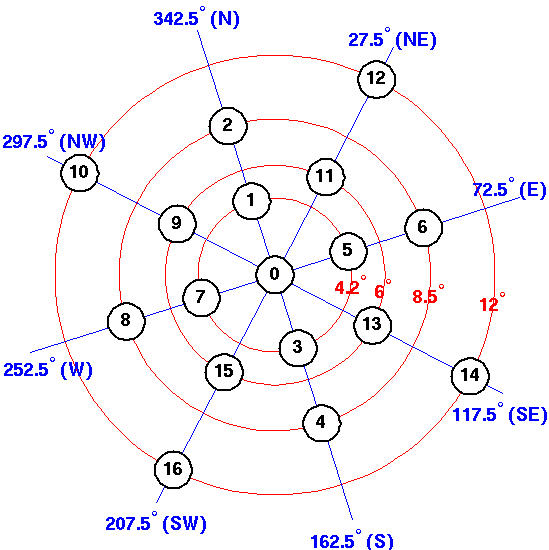 There are 17 possible beam pointing directions: in the vertical and at 4.2° 6°, 8.5° and 12° off-vertical in a variety of azimuths. The beam directions are typically described in terms of the nominal azimuths (shown in parentheses) which are rotated 17.5° clockwise relative to the actual azinuths. Standard-mode observations are made in the sequence NE6, SW6, Vertical, SE6, NW6, W4.2, N4.2 which takes approximately 2.5 minutes per cycle. The use of observations made in the vertical and a 6° off-vertical in 4, as opposed to 2, different azimuths allows for redundancy in the determination of the wind vector; the use of observations made at 4.2° off-vertical allows for the correction of beam zenith angles for the effects of aspect sensitivity. Page maintained by David Hooper. Last updated 28th June 2004.